Tim picked me up from an appointment on his Xtracycle last week. It sure was nice to be the passenger for once. 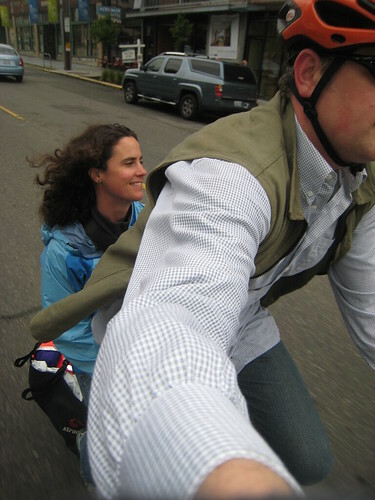 We rode a little under two miles like this–not a bad way to travel. I kept asking Tim if he wanted me to get off and walk and he repeatedly said, “No”. So I sat back, savored the view and the experience and enjoyed the ride. I have to say it was quite nice. Good thing Tim is a safe rider, you really have to trust your captain when you’re the passenger. This entry was posted in alternative transportation, bikes, longbikes, xtracycle and tagged alternative transportation, passenger, snapdeck, xtracycle. Bookmark the permalink. Nice! My husband needs to get an Xtracycle too so he can give me a ride once and a while!